A very special Texas camping facility is celebrating its 25th year of serving special needs children and teens form the Dallas/Fort Worth area. Two of the first camps in the Dallas, Texas area serving children with special medical needs were a Muscular Dystrophy Camp (founded in 1967) and a Cystic Fibrosis Camp (1979), which came along a dozen years later. However, organizers found that availability for accommodation of these camps at existing traditional Texas summer camp facilities was sometimes difficult to schedule, and additionally, host sites often did not meet the programming and accessibility needs of special needs campers. It soon became clear that a dedicated facility was needed to ensure long-term camping opportunities for this unique population of children in the Dallas/Fort Worth area. In 1984 and ’85, a group comprised of child life specialists, doctors, social workers, camping professionals, and community members was assembled by a dedicated donor who wished to remain anonymous, to assess the value camping adds to the lives of children living with health challenges. • How does the camping experience relate to the treatment/management of disease? • How will children who attend camp benefit from their experiences? • Could camps accommodate acutely ill children? It was concluded that establishment of a shared, permanent camping site with medical facilities for special needs focused camping was a realistic, positive option warranting significant effort and support. Turning enthusiasm, concern and vision into action, the group organized additional community gatherings, a task force was formed to research medical camping, and volunteers began organizing and fundraising. Crucially, the anonymous organizer and donor gave $1 million dollars in thanks for the blessings of life and children to get the project off the ground. Special Camps for Special Kids was incorporated in 1987, and duly filed an application for non-profit status with the IRS. The organization then formed its first Board, with Susan Williams, a nurse involved in the first camp in Dallas for children diagnosed with cystic fibrosis, chosen as Board chairman. Also in 1987, John Marc Myers, a nine-year-old Dallas boy who enjoyed spending time outdoors and had a special passion for spotting deer, turkey, and other wildlife at Old Sundown, his family’s Bosque County ranch, died from a form of bone cancer known as osteogenic sarcoma. In 1988 John Marc’s parents, Jan and Marc Myers generously donated 135 acres of land from the Bosque County ranch located in Meridian, Texas (85 miles southwest of Dallas) in honor of their son and dedicated to become the special needs camp facility’s home site. Thanks to the Myers’ gift, thousands of kids with chronic illnesses/major physical disabilities such as Sickle-cell Disease, Burn Survivors, Heart Disease, Boys with Hemophilia, Muscular dystrophy, Cancer, Brain injuries, HIV/AIDS, Spina bifid a, and more living in the Dallas/Fort Worth area now enjoy the same land that had meant so much to their son. During the next two years, the special needs camp founding advocacy group made substantial progress, and not long after the Myers land donation, the facility was officially named Camp John Marc Myers. Vance Gilmore, a camping industry veteran and outdoor enthusiast who has spent his career serving children with special needs was hired as executive director and remains in that position today. Don Madsen, a Dallas architect and friend of the Myers family, was tasked with developing a camp layout and design featuring a warm, welcoming and whimsical aesthetic that has helped define and symbolize the spirit of CJM. Additionally, many volunteers began cultivating relationships with Dallas/Fort Worth area children’s hospitals and assisting the camp founders with the project. Meanwhile, early financial gifts allowed the camp visionaries to work quickly in order to be positioned to serve campers as quickly as possible. The Meadows Foundation donated $500,000, The Constantin Foundation (through the efforts of Ray Bean, a former YMCA Camp Director and important CJM volunteer) gave $200,000, The Pauline Allen Gill Foundation contributed $150,000, the Hoblitzelle Foundation gave $120,000, and the Junior League of Dallas donated $100,000 — all very significant contributions. 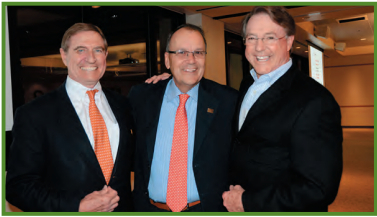 The Junior League also provided significant early organizational leadership, and later that same year, Camp John Marc Myers received $660,000 from the Dallas Crystal Charity Ball. More than 500 people attended the camp ground-breaking ceremony in 1990, with Jim Smith, a pastor at Highland Park Presbyterian Church, giving an invocation and the Board presenting Mr. Madsen, who acknowledged that his love of John Marc Myers had provided his motivation and inspiration for the camp design, with a cornerstone. In June 1991, just a year and a half after the official groundbreaking, Camp John Marc Meyers was ready for its first campers, and it welcomed some 500 campers over eight weeks of organized camping during its inaugural summer of operation. The therapeutic benefits of the outdoors finally became a reality for campers from Children’s Medical Center and Texas Scottish Rite Hospital. Now, almost 25 years later, CJM is a year-round therapeutic camp for Texas-area children currently hosting eleven week-long summer camps and over 25 weekend camps per season, with an average of more than 3,000 children, teens and family members attending a CJM camp each year. Year round programming and specialized camp facilities are uniquely designed in partnership with Dallas/Fort Worth area pediatric hospitals, community volunteers, and health organizations dedicated to serving campers living with chronic medical and physical challenges. The dignity of each camper is nurtured at Camp John Marc as well as in the community through the camp’s outreach programs. 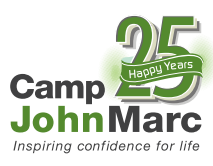 Camp John Marc’s original logo, featuring busy campers under an oak tree, represented the organization well for 23 years. In 2011, a new logo, reflecting some of the ways CJM has grown and changed through the years, was unveiled. More recently, a new practicum in Child Life has been offered to CJM summer staff by Cook Children’s Medical Center — an opportunity for staff members interested in becoming child life specialists to gain first hand experience. Camp facilities include an eight-acre lake and fishing pier, a covered wagon and treehouse-themed camping areas, a beach-access pool, an arts and crafts building, a medical building, an athletic field, a multipurpose barn, a challenge course, an amphitheater, nature trails, a riding arena, a dining hall, 20 cabins, the Morning Star chapel, and the Silo activity building. CJM has also served as a therapeutic camping model for organizations across the country and abroad. Visitors have come from as close as Houston (Camp for All) and as far as Japan, Ghana and Australia to study CJM’s programming and facilities. In 2013, CJM hosted the Special Needs Kindred Group, in which representatives of 38 Special Needs Camps in 19 different states spent three days sharing and learning. Today, CJM has a full-time administrative staff of five, a full-time facility staff of three, a summer staff of 24 and the support of over 1,000 volunteers annually. Most children and families served by Camp John Marc live in or near the Dallas/Fort Worth area, but participating camps can also invite children living in other parts of Texas. Each Camp John Marc camp serves children and teens who share a common medical or physical challenge. A week of summer camp for a single camper costs $585. Participating camps pay $195, while Camp John Marc covers the remaining $390, as well as fully funding two summer camps for children otherwise would not otherwise be able to participate). By subsidizing two-thirds of the camper’s cost and maximizing use of volunteers, CJM provides a residential camp experience for far less than what many traditional summer camp host sites charge organizations and camps serving children with special medical or accessibility needs. 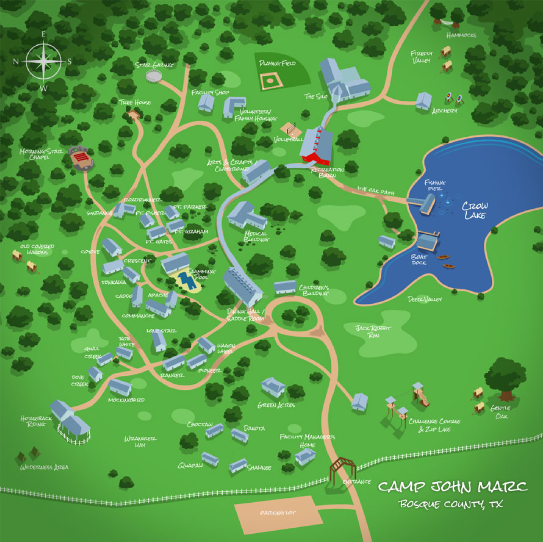 In addition to muscular dystrophy, Camp John Marc offers camping experiences for children with asthma, bereavement, blindness, burns, cancer, craniofacial disorders, deafness, gastrointestinal disorders, heart disease, hemophilia, HIV, juvenile arthritis, kidney disease, sickle cell anemia, spina bifida, upper limb differences, and transplants. 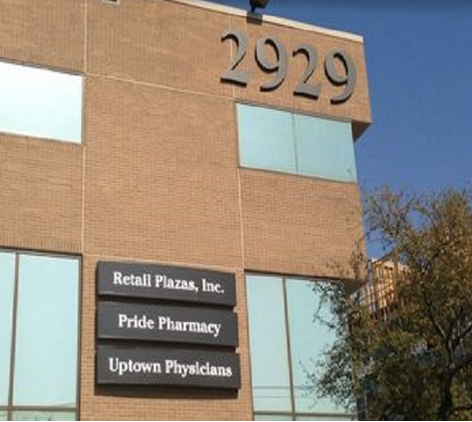 The Camp John Marc Administrative Offices are located at 2929 Carlisle Street, Suite 355, Dallas, Texas 75204.